Thought it’s not like there is any shortage of Bluetooth headphones out there, Bang & Olufsen is now throwing itself into the fray. At its CES event yesterday, the audio company showed off the newest model in its headphones series, the H8. But more so than its other models, these small on-ears are aimed at practicality: it’s the first B&O earset with active noise canceling (ANC) and wireless connectivity. Now, if you’re serious about your audio, you might know those two things typically spell sound-quality disaster. Bluetooth compression generally introduces artifacts, and interference from the ANC system degrades the signal playing from the headphone’s drivers. B&O assures us, however, that’s not the case with the H8; it’s meant to be a premium product. The headphone works on Bluetooth 4.0 technology using the aptX codec, which should theoretically solve Bluetooth’s audio quality problems up to at least CD quality. 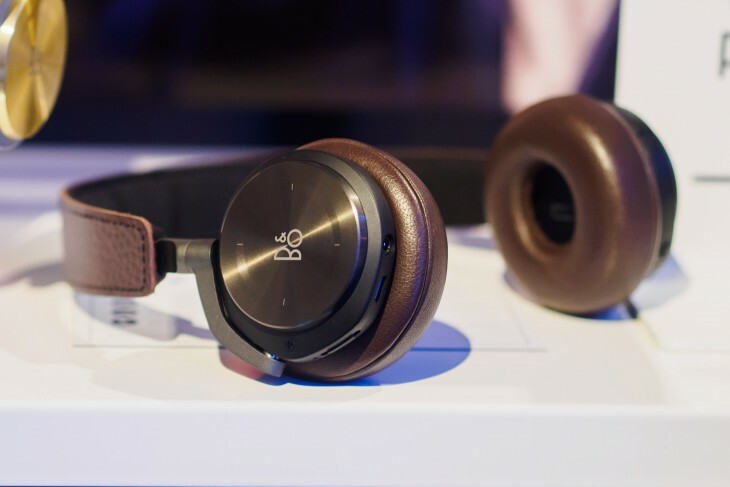 As for the noise-canceling, B&O says they would not release a noise canceling headphone until they achieved the right balance betweeen sound quality and noise canceling. And you know what – it sounded great. I only had a brief trial with the headset, but the ANC did a very good job of canceling out the noise. Pairing the device to my phone took seconds (there’s a position in the on/off switch for pairing), and Dvorak’s New World Symphony came out pristine clear even with the noise canceling on. These aren’t tuned for bassheads, but modern tracks like Michael Jackson’s “Love Never Felt So Good” came in with more than enough thump to keep things exciting. I also tried it with ANC off briefly, but there was too much chatter around me for it to be a worthwhile venture (but if anything, it will probably only sound better). You may have noticed a lack of buttons on the device; that’s because the right side is touch sensitive. A circular gesture controls volume, a tap will play/pause, a forward swipe will skip tracks, etc. All the gestures worked perfectly almost every time, try as I might to make it fail. One cool tidbit – the touch sensitive portion isn’t capacative. Instead, it actually measures tiny distortions in the aluminum as you place your finger on it. It worked very well, as I only needed the slightest of touches for it to recognize my gestures. It’s not just fancy technology though: capacative sensors tend to mess up when surrounded by moisture, such as during a fog or if your hands are sweaty. No such issue here, B&O tells us. The H8 is also extremely light and comfortable. It’s pads are memory foam, and the headset is one the lightest in the category according to the company (255 grams). Build remains top notch though: aluminum and leather throughout. “If it looks like leather, it is leather,” a representative noted. The H8 will be available from B&O’s online stores and “select third party retailers’ later this month. It looks like a standout product so far, but here’s the caveat: it will be released with an MSRP of 499 USD (and 499 EUR). That’s pretty expensive for an on-ear set, but also relatively in line with some other high-end ANC wireless headsets. We look forward to giving it a full rundown when we get our hands on it some more.